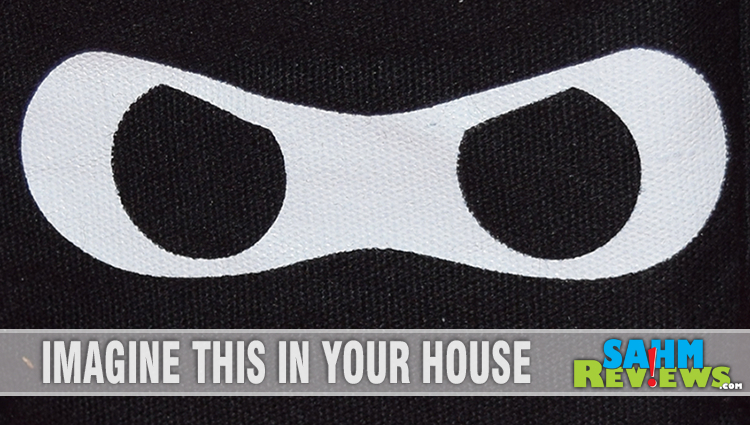 How Many Ninjas in Your House? Home / Recreation / Games / How Many Ninjas in Your House? Back in March my youngest filmed her first game tutorial when we featured Martian Dice by Tasty Minstrel Games. Having played Zombie Dice with our local game group, this Martian version was a slight step up in complexity and was a theme that was a little less scary than the undead. While we were at Gen Con, we were chatting with Mr. Tony Gullotti of Greenbrier Games about his latest creation, Yashima (which we hope to tell you more about soon). He mentioned that he had a game that was being better received than the other themed dice games and promised that if we liked those even a little, we would love Ninja Dice. And after playing a few rounds of the base game (and a couple with their “Location” expansion), I can say he was 100% correct. 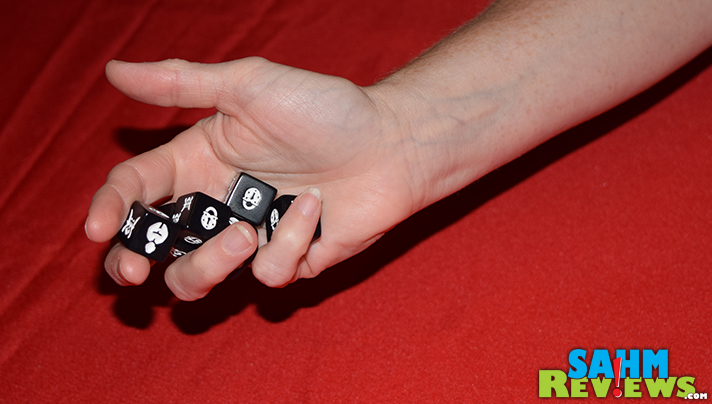 Much like the Zombie/Martian versions, Ninja Dice is a press-your-luck dice rolling game. 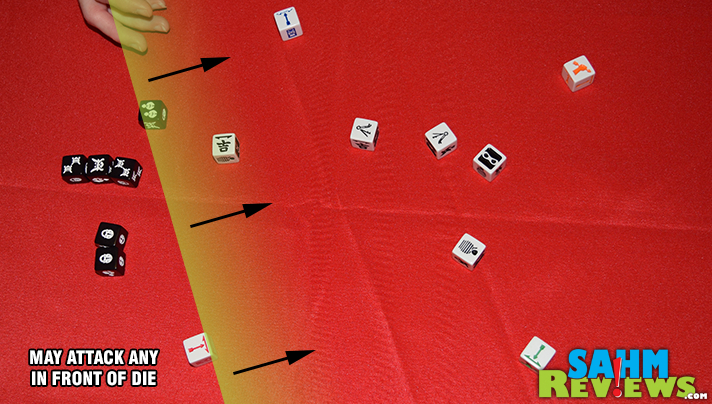 This means you can roll and re-roll your dice as many times as you’d like to try to get the best result possible. But there is a catch (isn’t there always?!). You have a limited amount of time in which to do so. But instead of going up against a timer, you’re actually trying to complete your task before your opponents roll hourglasses on their dice. Stay with me, it’ll make sense in a minute! 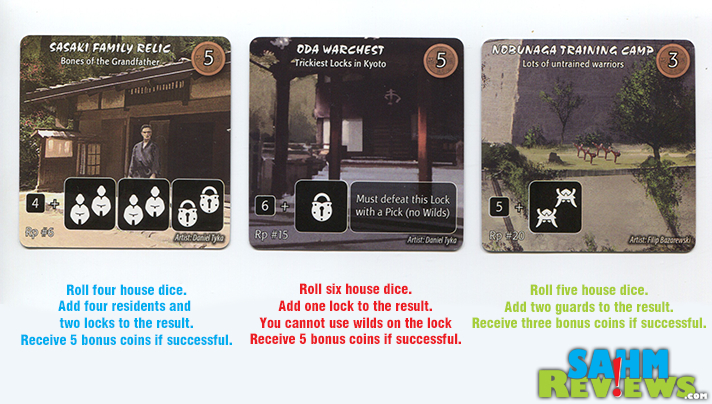 In Ninja Dice you each are playing as a ninja trying to break into a house and steal treasure. But the house is populated with locks, guards and residents. In order to successfully steal the house’s entire treasure, you must overcome all of these obstacles at the same time. There are three sets of dice: (6) House dice, (5) Skill dice and (4) Threat dice included in the very cute and foam-padded carrying case. 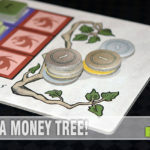 Each set performs a different task and are rolled by different players each turn. On your turn, you play the active ninja invading the house. The player to your right first rolls the house dice to determine which obstacles you need to defeat (the number of house dice rolled is dependent upon the round you are in – four for the first round, five for the second and all six in the third and final round). The House dice are set aside and sorted by the results. In this case six dice were rolled and you must now defeat two locks, three guards and four residents. 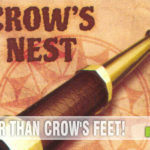 You are armed with only five Skill dice and have to hope the results match up with the obstacles. Lockpicks open locks, guards and residents can either be attacked or sneaked by. You aren’t alone out there. The other ninjas are also trying to get your (and the other players’) treasure and will attack you at any time they can. In fact, every other player (other than the active ninja) rolls one Threat die at the exact same time you roll your Skill dice. And after that, DO NOT TOUCH THE DICE! In a very unique twist, the position of the dice play an important role in the game. First, we look at the Threat dice results. They will have rolled either an hourglass, an arrow or a hand with an arrow in it (caught arrow). The arrows have a line underneath them that determines the area in which they can attack – basically a 180 degree arc from the base of the die. 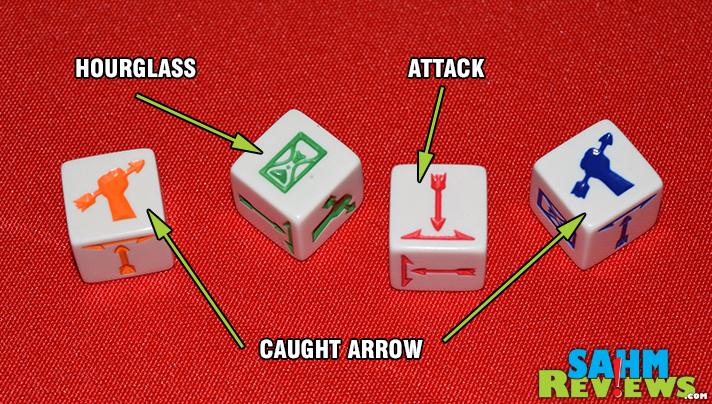 Any other dice that fall into that arc are valid targets for the arrow. That is unless the other players have rolled at least one “caught arrow’. If so, they are immune to attack for that roll. If you are successfully attacked, you lose one coin to the attacker. If an hourglass is rolled, it is set beside the house dice and not re-rolled (threat dice are re-rolled any time the active ninja decides to re-roll the Skill dice). If all four threat dice become hourglasses, the active ninja’s turn is immediately over and doesn’t receive any treasure (as alluded to above, they ran out of time). After all Threat dice are resolved, then the Skill dice are checked. The active ninja also has a special area-sensitive die result called “Fortune”. This Japanese symbol also has the same type of line beneath it, and its fortune (4x multiplier) can be applied to any of your own dice that fall inside of its arc. So when paired with an attack die, it counts as four attacks. 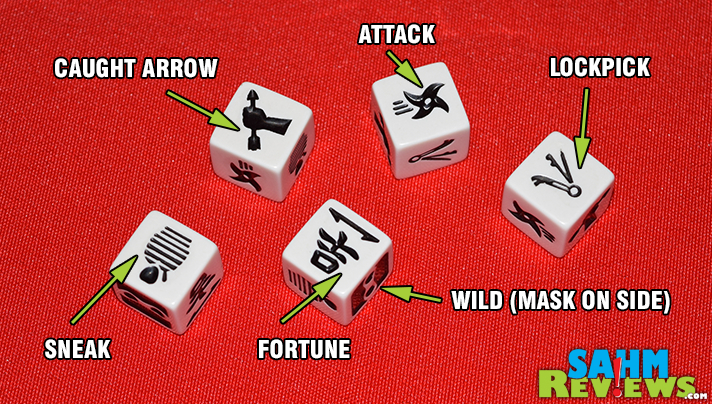 Set aside any dice you wish to keep and re-roll the rest, while the other ninjas also re-roll their Threat dice. You may do this as many times as you like trying to find the perfect combinations to beat everyone in the house – hopefully before your opponents roll all hourglasses. If you manage to beat the house, you receive one coin for each House die used that round. 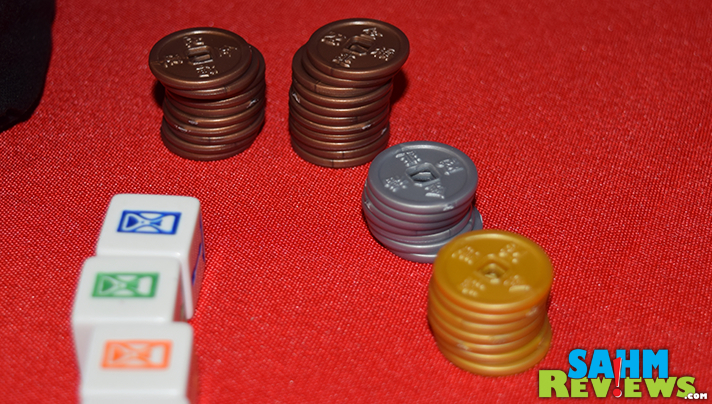 You also receive a bonus of one coin for a 4-dice House, two for a 5-dice house and three for beating six dice. In addition, if you managed to beat the house without using violence (attacking) and only lockpicking or sneaking, you are also awarded one additional coin! But at some point you may see that beating the house is next to impossible or you are running out of time. At any point you can stop your roll, figure out how many house dice you can beat and take one coin for each of those. You forfeit any bonuses, but in the long run it is better than being caught by running out of time and receiving nothing for your efforts. Greenbrier Games has already issued a small, inexpensive expansion to the game in the form of Location cards. This 24-card set adds a number of different rules and challenges to the game. Each house is built on a certain location that gives it additional bonus defenses that must be overcome, along with an increase in treasure if defeated. For instance, if you were to draw the center card, you would be rolling against the results of six House dice along with an extra lock. In order to earn the 5 coin bonus you must defeat the entire house. You can still stop early and take a reward equal to the number of dice you defeat, but again you would forfeit the bonus. 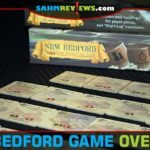 We found the base game to be better suited for those new to the game, and the expansion a perfect solution for keeping the game fresh and different each time once you have the hang of the mechanics. You can purchase both the base and the expansion directly from Greenbrier Games via their website or from Amazon. 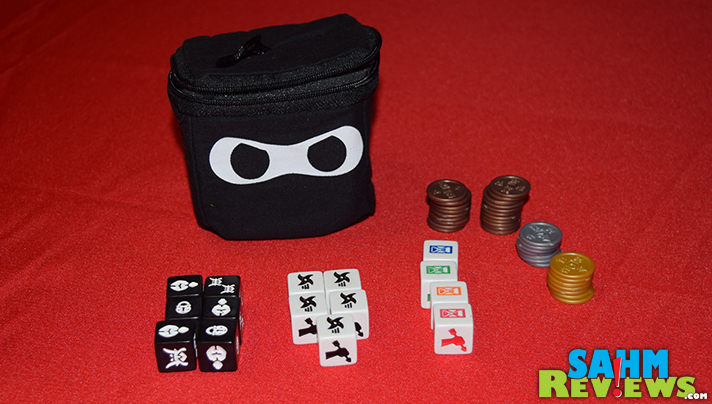 For under $20, Ninja Dice will certainly provide entertainment value that well exceeds the cost. Keep an eye on Greenbrier’s Facebook and Twitter timelines – they have a number of projects in the works and you don’t want to miss out on a single one! 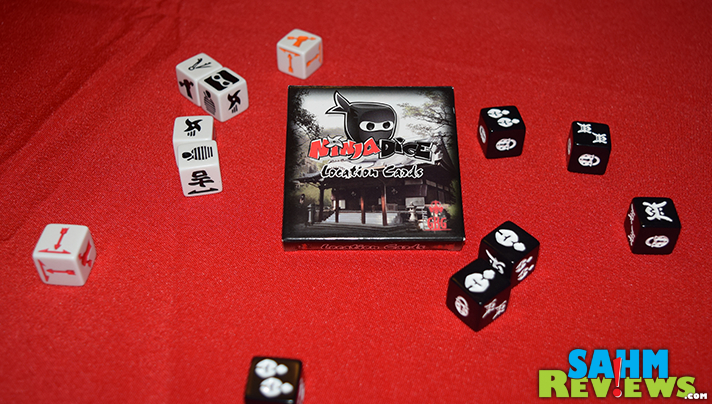 Greenbrier Games has recently published another expansion for Ninja Dice – Kage Masters! This inexpensive addition to the base game lets every player take on the role of a unique character with their own custom die. 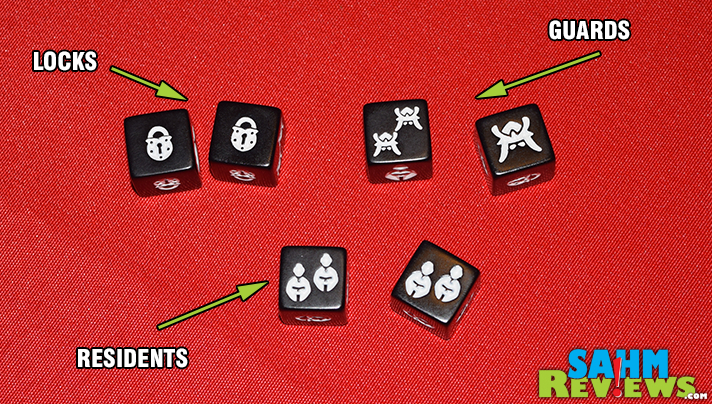 A welcome addition to the Ninja Dice world and a must-have for anyone who already has the original version! I like dice games. The randomness is a nice break from strategizing all the time and they are nice and easy to teach to younger kids. We love family game night. I bet my girls would love this game. I’d never heard of this before, but it looks really interesting. Dice games are fun! I’ve never heard of this game until today. My kids will love this. O I love games like this! Sounds so fun for the family! Oh – I bet my boys would love to play this game and it would get their heads away from a computer screen! What a cute game! I’d love to get this for my girls! This is such a cute game. My boys would love this because they swear that they are ninjas anyway. This sounds like a fun game. This will be perfect for our weekend family nights. I loved playing Dungeons & Dragons as a kid and this looks like a lot of good fun. Before the glut of adventure video games there was this and I may have three little ninja loving boys who would enjoy this. Thank you kindly. Woah! This looks like an intense ninja game! We love dice games here- going to check this one out! As always fresh new games, that make you want to grab one and have family time. Love it,I have never seen this game before. My son would love this dice game. He is all about ninjas. He has never played a dice game before but I bet he would have fun with it. My son has been talking about ninjas recently, so I’m sure he would love to play this game! I’m almost embarrassed to admit that this sounds too complicated for me!! I have a feeling my double vision would give me trouble and the other players a big advantage! It does sound like it could be fun. Oh how neat. Looks like this one would be fun for family game night. Okay maybe I am a big kid at heart but this game seems plenty fun for the grown ups too! Our family LOVES games and we have a game night here at least once a month – more in the winter I am totally getting this on payday! Thank you! I love the game concept of being a ninja but am not sure how I feel about the breaking in and stealing. This game looks like a lot of fun so long as kids can understand the pretend factor. Wow, there are a lot of twists and turns to this push-your-luck game! What a very cool looking game. Love all of it! Looks fun and easy to travel with. Love push your luck dice games. Looks like a nice filler game. I like dice games, and this looks like a great one! Thanks for the review! Do i understand this have flick mechanics? 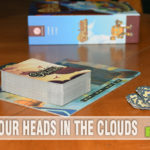 Looks like a neat filler-type game, thanks for the review! Looks easily portable, useful on long journeys. Very cool! I’d love to play it!